ZeeMaps provides easy mechanisms to highlight various geographies (e.g., countries, states, cities, zip codes) and geometries (polygons, circles) on a map. These highlighted areas or “regions” are helpful in marking out territories or service areas. 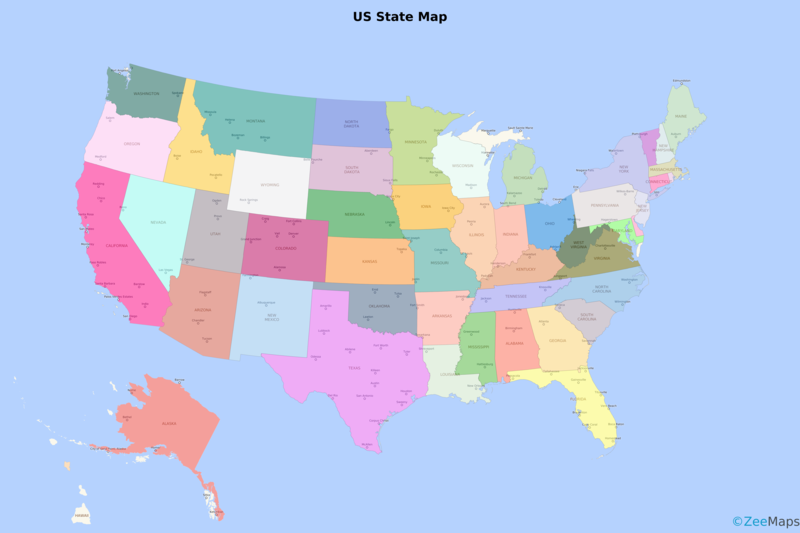 One of the areas that is specially useful to highlight is US Counties, a first level administrative sub-division in the United States after the state. County boundaries can be useful to analyze customer or sales data. Upload a list of counties contained in an Excel spreadsheet or CSV file, using the Additions -> Add (Upload) Multiple markers menu item on your map. The second option is helpful if you have hundreds or thousands of counties to highlight. This blog post reports on a new development for the second option of highlighting counties. We are always looking for ways to improve the user experience – whether we are implementing changes we think would be useful or responding to feedback from our users. We are constantly working to improve existing user functions and to add new ones. That’s why we’ve been busy making US counties easier to work with. One of the improvements has made highlighting US counties through spreadsheet upload far easier. Users can use a county name or FIPS code instead of specifying an address. In the rest of this post, we’ll use the following map as an example. The purple colored counties are the ten most populated counties in the US, and the orange ones are the least. You can click on a highlighted county to get the population for that county and its name. County: we use this column to identify the county to be highlighted. State: we use this column to disambiguate counties with the same name. If you are using just FIPS codes, or if your county names are unique, then this may not be necessary. Color: we use this column for the color of the highlighted area. ZeeMaps supports up to 32 different colors for most users, and up to 75 colors for our Enterprise users. A complete list of supported colors can be found on our Colors page. Population: The last two columns will be used as information to be shown when a user clicks on one of the highlighted county regions. Since this spreadsheet is for the ten most and ten least populated counties in the US, we show the population count from a 2017 estimate. County Name: we use this column so that some of the counties that have the FIPS code can be easily identified by a regular user who may or may not be aware of FIPS codes. You’ll see that the ‘County’ column (A) mixes county names and FIPS codes. To show the county name in the information bubble, there is a ‘County Name’ column (E) as well. To upload your spreadsheet, open your map and select Additions > Add (Upload) Multiple Markers. In the dialog box that follows, select the ‘US Counties’ option for Upload As. If you have any suggestions for improvements to ZeeMaps, please get in touch. When ZeeMaps started out in August of 2005, we wanted to keep things free of charge as much as possible. We’ve done pretty well with this, but the time has come where we have no choice but to make some changes. We have grown and there are thousands of maps being created each day. Whilst this is great news, it makes it impractical for us to keep offering a free service when we have to pay for the maps on a per-visit basis. That’s why we are changing the way in which our free maps can be viewed. If you are currently on the Basic (free) plan and want uninterrupted service, please upgrade to a paid plan before April 1st. To upgrade your account, first click the ‘Sign-In’ link on the top right of the homepage and enter your login information. Next, click on your name/email in the top right-hand corner and select ‘Account’. The tabs at the top of your account page allow you to manage and upgrade your subscriptions; manage users; and manage the cards you use to pay – among other things. If you created a free map without registering, you’ll have to Sign-Up in order to upgrade your account. Select the ‘Sign-Up’ link on the top right of the homepage to get started, then follow the instructions from there. Contact us if you have any questions or need any assistance – we’re always happy to help. And thanks for your patience and understanding. ZeeMaps allows you to add simple or detailed markers to a location map. You can do this individually, or in bulk by uploading a list of locations from a spreadsheet or table. One of our newest features allows you to change multiple markers at once, which makes editing multiple locations much quicker. And do you want to know the best bit? You don’t need a paid subscription to access this feature. That’s right – it’s free! It’s simple to change multiple markers at the same time on your location map. Select ‘Bulk Edits’ then ‘Change Some Markers’ from your map menu. A dialog box will ask you to select a set of markers (including regions) by dragging your mouse over the map. This allows you to draw a box around your markers. You can reposition the box until you’re happy you’ve included all the markers you want. Once you have selected your markers, you can edit them all in one place. The dialog box allows you to change the marker color from the dropdown list. You can also choose to add a description, an email address, a phone number or a website to all the selected markers. If you don’t want any information included, just leave the dialogue boxes empty here. Make sure you hit ‘Submit’ to see the changes appear on your map. Not only does this feature mean you can keep your map entries consistent, it also allows users to work far more quickly and effectively. We’ve had some feedback that it’s really useful for people organising garage sales, yard sales or even estate sales. It saves people so much time. We hope you will find it useful too.